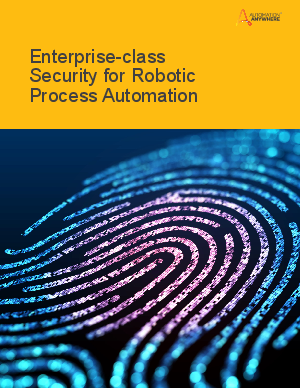 Robotic Process Automation was born with the vision of empowering business users to create software bots that could interact with enterprise systems just like humans. Its benefits include substantial time and cost savings, improved customer satisfaction, increased workforce morale, and the ability to build a competitive advantage over competitors. But to fully realize all these benefits, it’s important for businesses to select a solution with a robust RPA security architecture that supports core principles, such as least privileges and separation of duties while delivering end-to-end protection for the critical apps and sensitive data involved. This paper provides an overview of the industry’s highest standard for enterprise-grade security as demonstrated by the market’s leading Digital Workforce platform, Automation Anywhere Enterprise.